Yesterday I learned that one of the little 4 year olds in the centre where I work has been diagnosed with bone cancer. Devastating. My first thought was Why? Why does someone at the beginning of their young life need to go through this? Why should her parents have their lives turned upside down and inside out? Why should siblings have to learn about the frailty of life before they are even half grown themselves? Because that’s just the way it is. We don’t know why these things happen, or even if there is a reason. They just happen, often to the kindest, most loving people we know. This past week was busy. A tough one at work with a few challenges to overcome, the weather has been strange too. A cloudy, stormy low pressure moved across the country bringing lashings of rain for days, but with the high summer temperatures, we have experienced upwards of 95% humidity. After a few days of low pressure weather systems, I seem to develop a persistent headache so when the sun came out on Thursday and started drying up the land again, Friday afternoon seemed like the perfect time to end off the week at our local beach. Shakespear Regional Park is about a 5 minute drive from our home. We sometimes ride our bikes down to explore but last night, after a busy week, it was pure bliss to be able to drive down and spend a couple of hours playing in the water and walking along the beach. 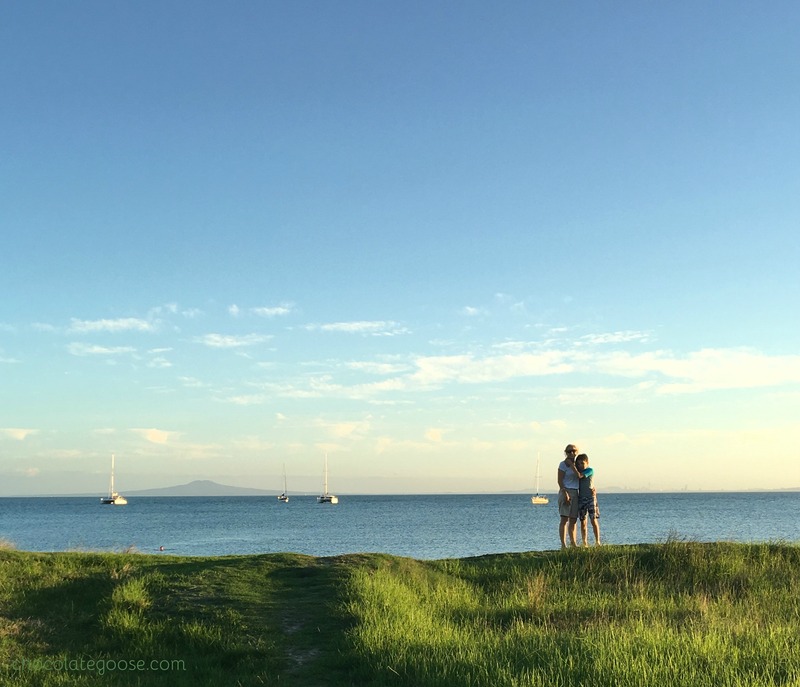 There were a few other families spaced out at intervals along the beach; a few boats in the bay, the cry of gulls never far away and the sun slowly setting with, Rangitoto Island holding court in the Hauraki Gulf off in the distance and the city of Auckland straight ahead as the crow flies. My little piece of Heaven right here. The perfect place to relax, breathe away the stresses of the week, refocus on what is important and enjoy spending time with my two special specials. As I sit in my study and write, I feel the gentle breeze rippling past the curtain at the open ranch slider, and the sound of cicadas singing their summer time tunes. A year ago this past week we put our home on the market. So much has happened in that year to renew my love for my husband, my faith in my God and my belief in my own strength and determination. Friends have come and gone. New opportunities have arisen, and my baby has grown another year older towards the amazing young man he will one day become. He also learned about the power of prayer this past week, first hand. It is truly a blessing watching an innocent new soul learn and grow, physically, emotionally and mentally. I am honoured and blessed. I truly pray for that family who face unspeakable challenges in the next few weeks. And I am thankful beyond words for my own path. You have expressed this so well.